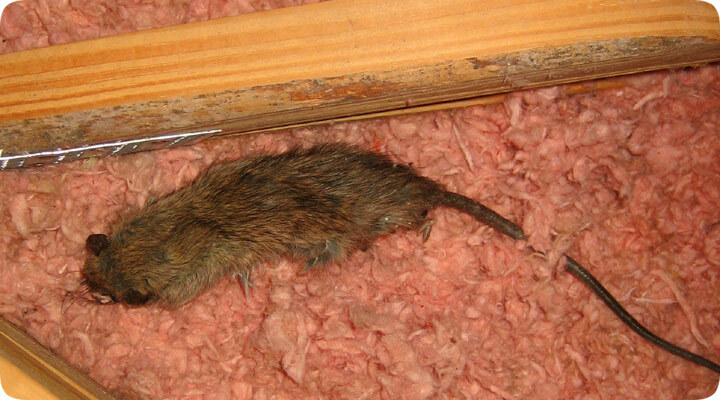 02.18.2004 - The problem with dead mice in the attic is that they are hard to find. This is because they love to burrow, and they dig their way down into the insulation. So when they die, they're already buried down in some tunnel. This is often right against the drywall ceiling, so the smell seeps down into the house and creates a strong odor within. However, when I go into the attic to search for the dead mouse, I barely smell anything, because the odor is blocked by the insulation, and the strong air flow in the attic, due to the ventilation, prevents much of the smell from building up. Next, I want to wear a hepa filter mask to prevent myself from breathing in fiberglass insulation. This prevents me from getting any kind of good stiff at the air. So I have to remove the mask and face the ensuing health risks. My trick is to sniff and sniff the attic space, back and forth, back and forth, until I get a whiff of the odor. It can be very subtle. However, when I hit it, I keep narrowing it down, back and forth, until I know I'm close. Then I get on all fours and dig around in the insulation, still sniffing, until I hit the jackpot, as seen in the above photo. I then bag it and spray it down and call it a job. The next step is to find out how that pesky mouse got into the attic in the first place, and to seal up all those open entry areas so that this sort of thing doesn't happen again.